The new Shugden reincarnation has a colorful past, perhaps best exemplifed by the life of Biwawa (aka Virupa) (837-909 AD). Biwawa, born again a few hundred years later, and a couple hundred years later again became known as Shugden. A photograph of Shugden in his current life of 30+ years has not yet been released. "Biwawa was born in India, to the east of Bodh Gaya, and joined Nalanda Monastery at a young age. Although he was an emanation of Manjushri and therefore a fully enlightened being, Biwawa studied and practised Buddha's teachings at Nalanda so as to demonstrate a perfect example of how to practise the path to liberation and enlightenment. During the day he studied and meditated on the Sutra teachings and during the night he practised the yogas of Heruka Tantra. As a result of his pure practice he was able to see Vajrayogini and her retinue directly. Whenever he made tsog offerings, Vajrayogini together with fifteen other Dakinis with whom he had a particularly strong karmic connection would come to his room to participate in the feast. Unfortunately, the other monks at Nalanda did not recognize Vajrayogini and the Dakinis but saw them as ordinary women. Believing that he was breaking his ordination vows, they became very critical of him and nicknamed him "Biwawa", which means "bad man". Thinking that Biwawa's behaviour gave the monastery a bad reputation, they asked him to leave. Although Biwawa had never broken any of his Vinaya vows, he agreed to leave Nalanda saying, "Yes, I am a bad man, I will leave." He handed back his robes, changed into lay clothes, and left the monastery. Then, just like a poor, homeless beggar, he began wandering from place to place. He first went to an area near Varanasi and lived in a cave deep in the forest. The land belonged to a non-Buddhist king who had an intense hatred of Buddhists. One day the king met Biwawa and invited him back to the palace, but when he learnt that Biwawa was a Buddhist he ordered his servants to kill him. The servants first tried drowning Biwawa, but they were unable to pick him up to throw him into the river. They then tried to bury him alive, but he reappeared the next day unharmed. Finally they tried to burn him to death, but again he emerged unharmed. When the king saw that Biwawa was able to protect himself through his miracle powers he developed strong faith in him and in the Buddhadharma, and he and all his subjects became Buddhist practitioners and disciples of Biwawa. This fulfilled a prediction made by an astrologer at the time of Biwawa's birth that Biwawa would become very powerful and, through demonstrating miracle powers, would cause many people to enter the Buddhadharma. Sometime later, Biwawa travelled south to the River Ganges. When he arrived at the river he asked a ferryman to take him across, but the ferryman refused because Biwawa had no money with which to pay him. Biwawa declared, "Since this river flows continuously, perhaps it is tired and would like a rest" and, causing the waters to part, he walked across to the other side. The ferryman was astounded and asked Biwawa who he was. Biwawa told him a little of his life story, whereupon the ferryman developed great faith and asked to become one of his disciples. Biwawa accepted him as a disciple and gave him many teachings. The ferryman practised diligently and eventually became a highly realized Yogi called Drombi Heruka, one of the eighty-four Mahasiddhas. Continuing on his travels, Biwawa reached a town where he stopped at the local tavern. After he had consumed several drinks the landlady asked him to pay, but Biwawa replied that he had no money. The landlady became angry and threatened him, "You have until sunset to pay me, otherwise I will call the authorities and have you thrown into jail!" Biwawa promptly used his miracle powers to stop the sun moving and held it motionless for three whole days. The local people were aghast and wondered how such a thing could happen. Finally they asked the king to help them. When the king asked Biwawa what was happening Biwawa replied that he was responsible for the sun not setting. "If I allow the sun to set," he explained, "I shall have to go jail." The king then reassured Biwawa that if he allowed the sun to set he would not have to pay for his drinks or go to jail. Upon hearing of his reprieve, Biwawa was delighted and immediately allowed the sun to continue its journey across the sky!" "Virupa, the dakini master, was born in Bengal in the eastern province of Tripura, during the reign of King Devapala. When still a young child, he entered the celebrated Buddhist monastic academy of Somapuri. There he devoted his life to study and meditation with a thousand other pious monks and received the initiation and empowerment of the dakini Vajra Varahi, the Sow-Faced One. Industriously, he recited her mantra twice ten million times for twelve long years. And yet, nothing happened. Not once in all those twelve years did he receive so much as a dream to indicate that he was making progress. At last, Virupa became so disgusted with himself and his apparently useless practice, that he threw his rosary into the latrine. Naturally, when the time came for evening worship, he did not have his prayer beads. Suddenly, Vajra Varahi herself appeared before him in a shining vision. She handed him an exquisitely carved rosary and said: "Child of Happiness, why are you so troubled? Keep up your practice, for you are blessed by me, If you would see clearly that things are neither this nor that, you must let go your wandering, critical thoughts. Strip your mind of illusion!" Deeply inspired, Virupa renewed his practice of the spiritual discipline of his dakini-guru for another twelve years, gaining the supreme realization of mahamudra. As he had attained power over the duality of life and death, he saw no contradiction in eating meat or drinking alcohol, although it was against the rules of his order. One day he asked his servants for pigeon pie, whereupon they caught a few of the pigeons that roosted in the eaves of the monastery, wrung their necks, and prepared them for the table. However, an elderly monk noticed that the pigeons had disappeared. Shouting, "Let him who has the audacity to eat pigeons come forth," he ran to the great bell to call everyone to assembly. "Surely none of us would do such an abominable thing!" whispered the venerable monks in astonishment. But the abbot ordered a cell-to-cell search. Before long they came to Virupa, sitting down with happy anticipation to a meal of pigeon and wine. Outraged, the monks stripped him of his office and ordered him to leave the monastery. Virupa removed his habit and laid it with his begging bowl before the image of the Buddha that he had worshiped for more than a quarter of a century, and prostrated himself in homage before the image. Then he left by the monastery gate. One of his first adventures occurred at the banks of the river Ganges where Virupa beseeched Ganga Devi, the goddess of the river, to give him something to eat and drink for he had traveled far. But she refused. Whereupon Virupa commanded the waters to part and marched across to the other bank. By the time he reached the nearby town of Kanasata he was ravenous. Entering a tavern, he demanded a flagon of wine and a plate of rice, which he devoured with gusto. Then he roared for more drink, then more and more, until he had drunk the tavern dry. When the suspicious tavern keeper asked him to settle his bill, Virupa offered her the sun in the sky. To seal his pledge, he took his phurba from his robes and thrust this magical dagger exactly halfway between the light and the darkness, thus transfixing the daystar so it could not continue on its course. For the next two and a half days the town of Kanasata was plagued with continual daylight and unremitting heat. The crops withered in the field, and even the river began to shrink from her banks. Virupa, however, continued to drink, consuming five hundred elephant loads of spirits. By this time, the king himself was at his wit's end. As yet unaware of Virupa's presence, he commanded his minister to discover the cause of the endless, blinding sunlight, but his investigations were fruitless. Finally, the sun goddess herself appeared to the king in a dream, revealing that a siddha's debt to a woman in a tavern imprisoned her above his realm. To rid himself of this disaster, the king was forced to pay the debt. Thereupon, Virupa vanished and the sun moved once again across the heavens. Virupa then went on his way, journeying the length and breadth of India. When, many years later, he returned to Devikotta, it had become a peaceful town filled with devout Buddhists. To celebrate Virupa's return, Mahadeva, the Great God Siva, and Umadevi, his consort, devised a spectacular illusion in the yogin's honor. As Virupa stood on the road, surveying the town, it doubled and tripled in size until it had become a magnificent city of half a million households. People poured from their homes to welcome Virupa with offerings, while from the Thirty-three Sensual Paradises and all the palaces of the gods there flowed an endless array of the most exquisite food for a huge feast of celebration. 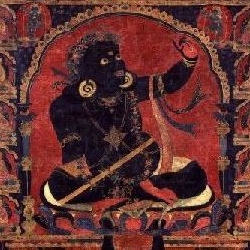 And yet, the great dakini master was not to attain ultimate liberation until he had lived seven hundred years. But then, as the great discus hurled itself across the vastness of space, his labors at last completed. Virupa ascended to the Paradise of the Dakinis." Will the new Shugden generate similar stories for future generations to enjoy? A recurring theme with the various alleged Shugden incarnations is that Shugden as reincarnation of Manjushri, who was a Buddha before Buddha Shakyamuni, according to Buddha Shakyamuni; nevertheless, in most of Shugden's lifetimes, he had to train again to become a Buddha...in one of them it took 700 years to do so. Biwawa's life seems less one of a Buddha but more one of a gluttonous drunkard womanizer who would stop the world's rotation for days to get out of paying his bar bill, a feat that would kill billions of living beings.